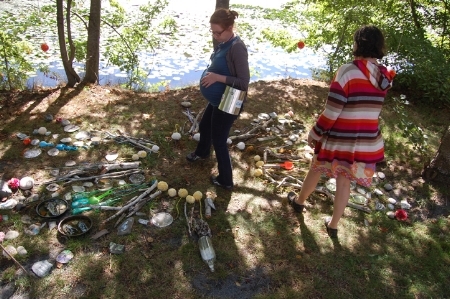 “We Are Here: River Year” is artist Kari Percival’s temporary art installation of an ecological and astronomical calendar for this spot on the bank of the Mystic River. Viewers are invited to stand in the center of the circle of flotsam and jetsam, to view an array of seasonal events that mark the changes of the year on the Mystic River, such as the time in April and May when the Alewives crowd up the river to spawn, or in November when the hooded mergansers return from Canada to overwinter here, or the time in March when the Kingfishers return as the ice breaks up. The tiny paintings are on slate collected from the mouth of the Mystic River in Chelsea and birch bark collected at its headwaters. A basket of extra pieces of slate and chalk invites viewers to add their own favorite Mystic River moments to the art installation. This art project has been made possible by the Medford Arts Council, the Mass Cultural Council, and the Mystic River Watershed Association.